Alessandro Cimarelli published his debut novel in march 2012. His book “A turtle’s dream” is a travel memoir where the author writes about places, people and experiences in an exotic land. The main character is driven by a passion for windsurf. Cimarelli is one of these authors who did choose the path of self publishing. Even if he did send his manuscript to several publishing house for evaluation, Alessandro eventually decided to go through this ordeal (self publishing is no bed of roses) with determination and passion. The plot is simple and linear (and I like it that way): “Marco decides to go on a vacation to Cabarete, a location in caribbeans where he plans to practice his passion: windsurf. At the beginning of his journey Marco finds extactly what he is looking for: sea, sun and adrenalin. The waves under the board make him feel alive, more than ever. 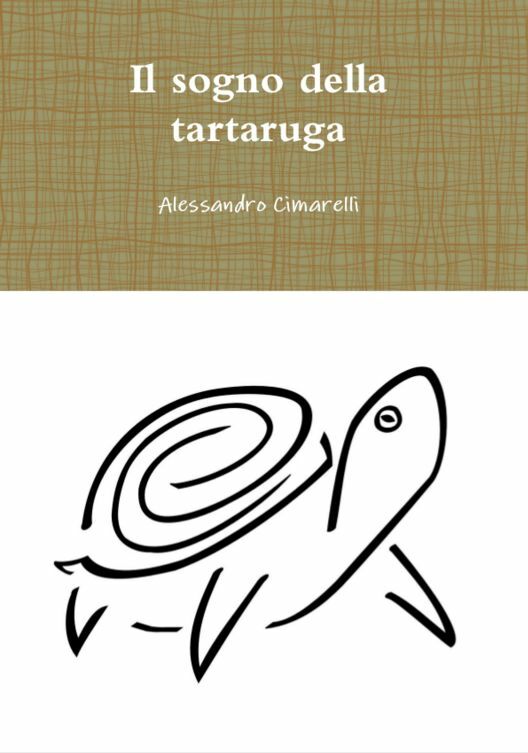 Marco meets several people, but he particularly involved by Dahlia, a french girl and a turtle with a white spot on its shell, leading him in a different dimension, to a long forgotten part of his self. Every choice Marco takes during his stay in Cabarete will lead him to the right place at the right time in order to fulfill his destiny”. This novel might be looking for an english translation and distribution. How did you come up with the concept for this novel? I have always been writing during my trips. Whenever I travel I always take with me a notebook where I take note of everything that happens. During my trip in Cabarete in 2007, however, several events made me think. What I was writing during my stay became a story, over time, and even if many of the events actually happened, they are intertwined with dreams and nightmares, leading to a fantastic tale. Is this novel is partially biographical? Yes. I think that’s the fun part, trying to guess what’s real and what’s not real. I would love being asked “did this really happen to you?”. In your book there is recurring reference to body experiences, like the fatigue while swimming and the feel of the wind on the skin while windsurfing. What is the importance of the body in writing? I think it is very important. If a writer manages to convey to a reader what a character is feeling from the point of view of his own body, then the reader will have a more vivid experience. If you can reach the reader’s imagination through bodily experiences, he will be more involved in the story. Without spoiling, is there a supernatural element in your novel? Yes, as the title alone suggests. Dreaming is a door beyond the material world where we are used to live. In dreams you can be what you want and sometimes even see what you will be. How long did it take for you to write and revise your novel? I began writing right after my stay in Cabarete, in may 2007. Then I finished writing my novel while travelling all around Italy as an IT consultant. I completed the “Turtle’s dream” in april 2009, after almost two years. I left the manuscript for a few months and then started revising. However, something happened in june 2009, and this event blocked me both physically and mentally. One of my closest friend died during a kitesurf incident. I had been travelling with him to several spots where we could practice our sports. His loss scarred me and I didn’t want to write anymore. He was the one encouraging me to finish and try to publish my novel. Something I did not think I could do. There is something he used to say “when you’re done we drive around fairs and even if we don’t sell a copy, we can eat good food”. Then even pain dulls out over time, and in october 2011 I took the manuscript again. I was lucky enough to meet someone who helped me understand the value of my novel and helped me with a revision. Then I cut certain parts, developed other parts, corrected errors, until I had a more or less “clean” text. After five more months I decided my novel was ready. Revision is the hardest part, because it never ends. If I read the book right now I would change it further, but you need to stop at some point. This part requires a lot of will and committment. Having someone to advice you can help you too, but you need to focus on your own work and do whatever it takes to finish your book. Did you try to publish your novel through a House? I have been studying the market very closely on the internet. I went to blogs and forums where users talked about their experiences with publishing houses. Then I decided to follow that same road and sent the manuscript to twelve publishing houses. I picked them out carefully, judging what kind of books they were already publishing. The possibility of sending the manuscript electronically was also a requirement. I had the first answer in less than a week. This particulat publishing house was “interested” in publishing my book if I was willing to pay 1.200 euros for 100 copies. They would take care of the revision, editing, cover and distribution. But I asked myself: how was it possible for them to properly evaluate my novel in less than a week? After month I received two more proposals, praising the qualities of my novel, but once again, they were asking for money. Of course, they were offering several interesting services, but I did not feel like it investing that kind of money. I think that if a publishing house really believes in what I write, then they should take the risk of publishing it, it’s their job. How did you decide for self publishing? After these experiences I was more and more interested in self publishing. One of my friends already published on two different sites, ilmiolibro.it and lulu.com, so I studied both sites and considered the costs. The first one with a single 100 euros installment gives you the chance to distribution through LaFeltrinelli, one of the most important library franchises in Italy (but potential readers would have to special order the book as it was off shelf). The second service provides free distribution through Amazon.com. I thought the two offers would give my novel a wider visibility. The only problem is that you have to take care of the promotional part of the process, through a careful use of social marketing. Meanwhile I have sent the manuscript to 25 Publishing houses, as I am not ruling out this possibility yet. Did you receive any “indecent proposals” from any publishing houses? A publishing house asked me 2.300 euros for 500 copies. I would get the money back if managed to sell them all. I had a share of the earnings equal to a 6% for the first 500 copies, raising a 12% for every copy after the 500th. Another house asked for 900 euros for 100 copies. I “only had to pay” for unsold copies. What advice would you give to someone considering self publishing? I only want to say that you need a lot of patience and hard work. Most of all, you need a lot of time to take care of every aspect because the promotion is very complicated. There are some expenses too, it’s not completely free as you might think. On the other hand you have total control of your work, you can change everything at any time. If you really believe in your work and you are in for the intricacies of social marketing, then you are headed in the right direction.